Fins Grill and Icehouse in Port Aransas, Texas! : Great restaurant right on the harbor, a fun and delish place to eat!! Tigger Travels - Family Adventure Journal Photos From Tigger`s Travels and MORE! 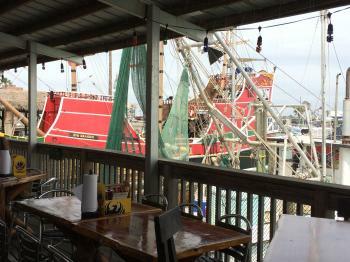 Fins Grill and Icehouse in Port Aransas, Texas! Great restaurant right on the harbor, a fun and delish place to eat!! 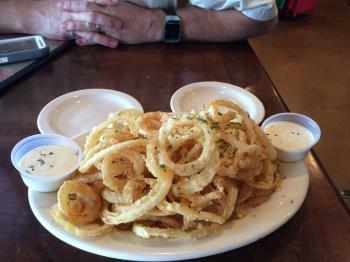 When visiting Port Aransas, Texas, there are a few places that Tigger always stops in! 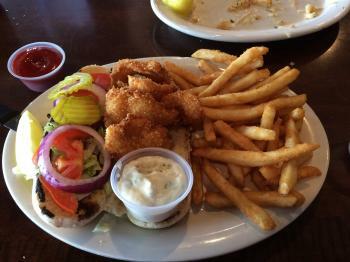 One of the great meals is the Po Boys and other menu items at the Fins Grill and Icehouse right on the Harbor. They offer a great selection of fried and baked food that will delight any taste buds! "U Hook Em, We Cook Em", that's their motto. After your fishing trip, let the professionals prepare your catch. They will cook it up just the way you like it, while you spend your time relaxing on our deck. "There nothing better than your own fresh caught fish." Also, don't miss the Red Dragon Pirate Cruises right next door!! 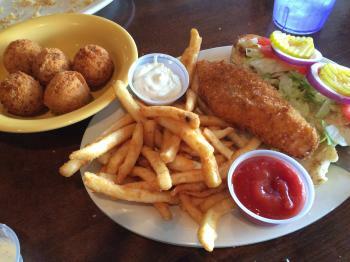 Gulf Fish Po Boy with Hushpuppies!